Audi has relentlessly pursued new markets and niches across its whole range, and having successfully created the smallest car to wear the four rings with the A1 it has now expanded it still further with the introduction of a performance variant. 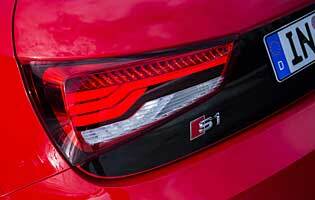 Wearing the well-known S badge, the S1 now means there is a performance version of all the mainstream Audi models. It was a bold step for Audi to introduce the A1 2010 as it was a relatively radical step to expand the premium brand into the supermini segment, but its success has proven that buyers are prepared to pay for a premium small car. With three-door and five-door Sportback models the next logical step for the brand was to introduce a performance version. Audi had already tested the water by producing a limited edition A1 Quattro, which despite being left-hand drive only and carrying a price tag in excess of GBP40,000 was a sell-out, although this amounted to only 33 examples in the UK. The S1 shares the basic template of the A1 Quattro but in a more realistic mass-produced form. The basic bodyshell of the A1 remains broadly the same whether in three or five-door form, but visually it is enhanced with an eye-catching bodykit comprising of deeper bumpers front and rear, a larger front grille, side skirts and larger alloy wheels. It can be altered still further with an optional Quattro pack which adds black detailing, graphics and a rear spoiler. Mechanically the S1 is the only A1 model to have four-wheel drive as standard (the A1 Quattro is no longer on sale) and it also uses a brand-new petrol engine. 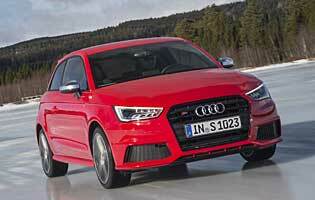 Although this is used in selected other Audi models the S1 is the only A1 model to benefit from it. The S1 also has more sophisticated multi-link rear suspension compared to the more compact torsion bean used on other A1 models. The S1 is not for everyone but it combines the ease of use and practicality of a small car with genuine performance and a fun to drive. AudiÃ­s well-lauded quality is here and this adds to the carÃ­s desirability. There are rivals that are cheaper similarly fast, but none of them so successfully combine performance, quality and showroom appeal. The S1 is a performance car but its compact dimensions mean relatively lightweight too, and the efficiency of the turbocharged engine means for a car of its performance it can be relatively frugal if driven carefully. Insurance costs will be higher than average as will consumables due to its performance. The S1 is as spacious and practical as any car of this size has a right to be; as long as they're all friends you can fit four passengers inside, although there is slightly less legroom due to the larger front seats. Storage space is reasonable too, while the boot is acceptably sized although reduced compared to the standard A1 due to the four-wheel-drive system. Audi displays are always a delight to behold and the S1 is no different. There's a genuine sense that the cabin of Audi's larger models has been shrunk to fit, and the knobs, buttons and luxuriously lit dial arrangement is every bit as classy as in the larger models. Steering is ideally weighted and works well in town and when driving enthusiastically. The S1 has excellent sports seats that are comfortable and supportive, while the rear bench seat is perfectly adequate. Noise levels are well managed, particularly with the engine, which only becomes vocal when extended. The ride is on the firm side, more so when the Dynamic setting is engaged on the Drive Select system. Remote central locking is naturally standard and a category one approved alarm and immobiliser are also present. Keyless ignition is also available. Secure storage inside is limited to the glovebox, but items stored in the boot remain out of sight. Driver and front passenger both benefit from front and side head airbags, while a raft of electronic safety aids includes acronyms such as ABS, EBD, ASR and EDL. Four-wheel-drive means the best traction available at all times too. Packing so much power into the compact shell of the S1 should result in impressive performance and it does not disappoint. Driven sensibly the plentiful torque makes urban driving surprisingly relaxed, although the ride is firmer than in the standard car. Out on the open road the impressive performance can be exploited, with the powerful engine sounding suitably sporty. 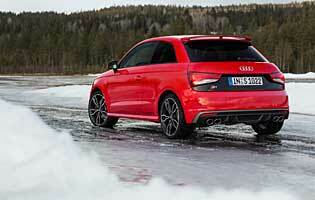 The handling is sharp and engaging, helped by the security of Quattro four-wheel-drive. The S1 can perform the family role but the Sportback version would clearly be better at it than the three-door version. A pair of child seats will comfortably fit into the rear, although the larger variety used for toddlers will leave only small amounts of legroom. Leather seats also means better resistance to the stains and general wear and tear that comes with small children. Although small and easy to drive, the S1 is a little too fast and probably too expensive for a new driver, even if they do have the funds to purchase it. This may be the smallest of all Audis but that doesn't mean any corners are cut in terms of quality. In fact the A1 is arguably more impressive in this respect as you don't expect a car of this size to offer this level of quality. Audi has a strong image in its own right but the high performance S and RS models draw on a rich motorsport heritage for even more kudos. Long doors go some way to easing the inevitable issues of reaching the rear seats in the three-door model, although the S1 comes with heavily-bolstered front seats that do making getting into the rear slightly more difficult than the standard car. Access to the boot is straightforward however. As with the rest of the A1 range the S1 has a 6.5-inch screen mounted in the top of the dashboard, and as you would expect on the top model the audio system has multiple inputs and includes Bluetooth streaming and hands-free telephony. The S1 comes in a range of its own specific colours, which are by and large pretty eye-catching and are a reference to the original Quattros of the 1980s. More subtle shades are also available. On the inside there are flashes of colours amongst the smart dark trim but as with the outside the option packs add yet more colour. The S1 remains a pleasingly compact car at under four metres in length, and that means it should pose few problems when parking. Good visibility and easily judged extremities are helpful and the S1 has parking sensors as standard. Petrol engine options - 1.2-litre (85bhp); 1.4-litre (120bhp, 138bhp); 2.0-litre (228bhp). Diesel engine options - 1.6-litre (103bhp); 2.0-litre (140bhp). Transmission options: five-speed manual gearbox, six-speed manual gearbox, seven-speed S tronic twin clutch automated manual gearbox with a switchable fully auto mode. Trim levels: SE, Sport, S line, S1.